Learning Culture: Our underpinning learning philosophy influences our learning culture; it affects peoples’ beliefs and behaviours and the importance they place on learning and talent development. A vibrant learning culture means everyone, regardless of role, cares about learning. It encourages people to develop and grow bringing resilience, loyalty and a winning edge. Lifelong Learners: Though we don’t always acknowledge it, we constantly evolve through our experiences and interactions, aside from any formalised development activities. We are all lifelong learners. This is especially true for scientists and engineers. Nurturing and investing in this desire to learn helps us create advantages for everyone; personally, professionally and commercially. 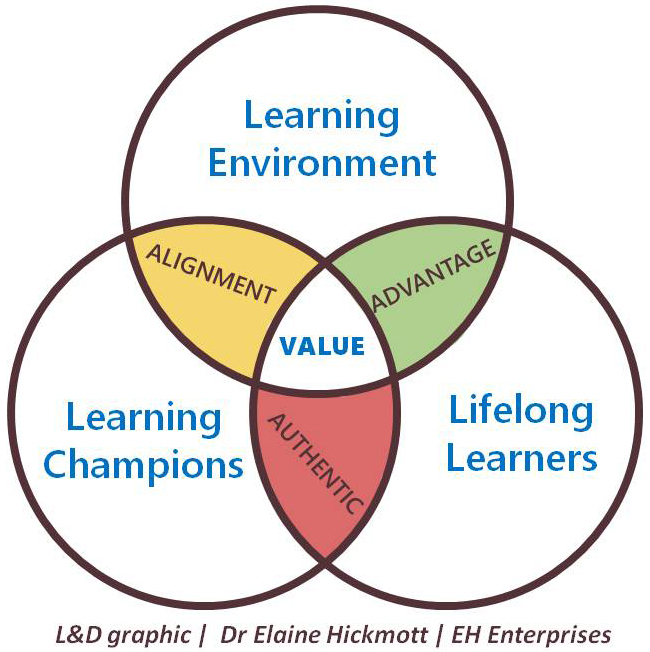 Learning Champions: Increasing the value of learning and development is not the sole responsibility of talent development professionals. Their role is to be learning champions; maintaining momentum, acting as advisor and strategic learning lead as well as curating, creating and implementing learning solutions. Being business-savvy and connected to the outside world brings an appreciation of internal drivers and external possibilities. The results: talent development which is aligned to organisational needs, is authentic and adds value. Dive into the hot topics and buzz words of learning and talent development and you could be excused for feeling slightly overwhelmed. Add that to the list of talent development ‘shoulds’ and ‘should not’s’, lying down in a dark room feels like a welcome remedy. Well it often works for me anyway! What are the strategic aims of talent development activities and programmes? In other words, why are we bothering? How will people and the organisation benefit? Are we creating talent development activities and programmes which add value and have positive impact at human and commercial levels? In other words, does it meet our strategic aims and how will we know? This is particularly important for organisations whose success relies upon the quality of their science and engineering talent. Ill-thought out, illogical initiatives can jar particularly with technical professionals; reducing trust or credibility. NOT a static same-old-same-old activity or a race to collect the newest shiniest fads and fancies. Learning and development adds value if we learn how to use it to create advantage, align it to our business goals and produce authentic talent development initiatives. For scientist and engineers complexity and change is a way of life where learning is the key to evolving and adapting. Learning and development adds value by being strategic, supportive and encouraging excellence. ” Working with Elaine is hugely valuable. She understands the human aspects as much as the business ones. She encourages innovative thinking and action, a grounded strategist – rare qualities indeed”. Ge tting in Touch: I’m always happy to discuss your strategic learning and talent development requirements. Drop me a line and we can get the conversation started.